Three years of high school in North Jersey, and I have almost no memories of food. The peaceful homogeneity of Morris County brought nothing of interest to the table, usually one at a diner under Greek ownership. Or perhaps food is the last thing on the mind of an emaciated 16 year old with blue hair. Of the things that didn't make a blip on my radar, there is one that is a New Jersey point of pride. Taylor Ham was introduced to the world by a Trenton gentleman named John Taylor, credit to whom is omitted as soon as you cross a bridge. In Philadelphia, this creation is called pork roll. After trying it, I've simplified it further by calling it 'slice of giant hot dog'. Seriously, what is the fuss about? I'd describe it further, but if you've had a hot dog, then you know. And if you haven't, health organizations would likely suggest that you continue the trend. Don't get me wrong, I love hot dogs. Believe or not, I've spent a little time working long shifts behind the counter at a 7-11 (yeah, that's right), and those slowly rotating grease tubes were my fuel. But I'm not into incorporating a giant form of this disgusting staple into my breakfast. New Jersey, you can have it. Also, I wouldn't mind if Teri's refunded the hour and a half of my life I spent waiting for a mediocre breakfast. I suggest eating it from N.N.J on an everything bagel with cheddar cheese and a semi-runny fried egg. Just to give it a second whirl. I agree, not the most memorable. Taylor pork roll, egg and cheese can be damn good (more like spam or salami than a hot dog). I always had it as a Philly diner thing, but I guess the Jerz owns it. did you have two slices of plain pork roll? that is a diservice to a wonderful product. 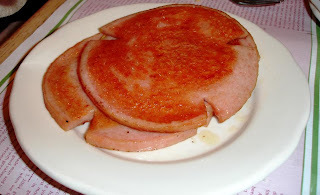 pork roll is a side but can be a meal. have a couple of slices of well done pork roll with some melted american cheese, preferably on a potato roll, but a hard round roll will do just as well, and dont forget the ketchup. if its breakfast, throw a fried egg in there as well. its a whole new world from what you described. and if you are looking for a hangover food, look no further.